Fran Belibi has captured the imagination of basketball fans with her astounding dunks. 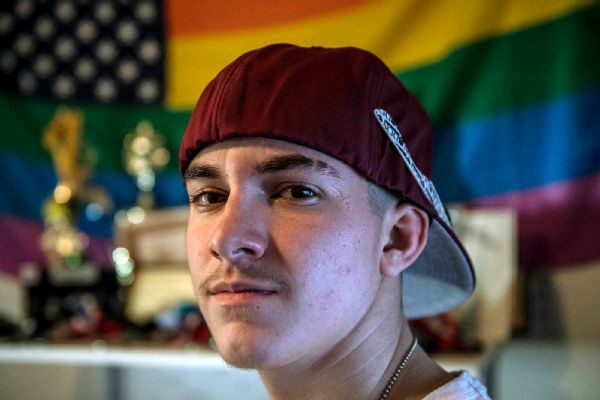 But the Stanford-bound star dreams of a different destiny. Students file into the gym at Regis Jesuit High School on a February night in Aurora, Colorado. Their feet, wet from the beginnings of snow, slide across the bleachers as they crowd into the student section. There is a hockey game taking place a few miles down the road, but the biggest draw for the senior boys in the front row is Fran Belibi. They run down her stats and debate the probability of whether she'll dunk. 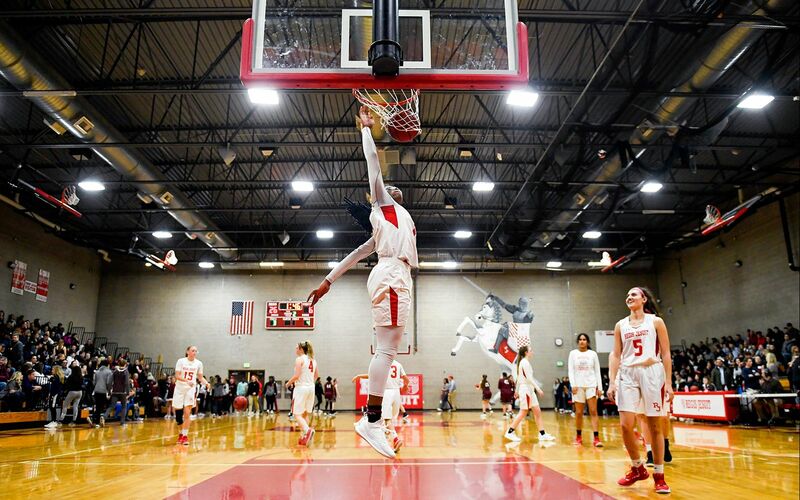 It's a Friday night, the second round of the state playoffs and one of her final home games before she heads to Stanford, so a dunk, they figure, isn't too much of a stretch. Just wait for a fast break, they say, just wait for a fast break. If there's going to be a dunk, that's when it will happen. The game is tighter than expected. Regis, one of the best teams in the state, is held to nine points in the first quarter. Cherokee Trail stifles every fast-break opportunity before Fran can leak out to go for a dunk. But in the fourth quarter, Regis Jesuit sophomore guard Avery Vansickle drives down the left side of the lane for a contested layup, and Fran crashes from the top of the key. She takes two long steps and leaps for the ball as it circles the rim, expecting it to come back toward her. In the student section, the boys strain to see if Fran is actually going to dunk off a rebound. Instead, the ball rolls untouched to the other side of the rim and Fran pulls her hand away. Fascination and anticipation follow Fran wherever she goes. There's a simple reason for that: Her actions mute critics' words. The "problem" with women's basketball, they say, is that women can't dunk. Fran begs to differ. Left-handed or right-handed. Women's ball. Men's ball. One-handed down the lane. One-handed reverse. Off the backboard. Off an alley-oop. The hype surrounding Fran Belibi has grown with each dunk. She's listed at 6-foot-1, but without shoes, she's only 5-11. You can't say she's too tall, or that her dunks are weak, or that she has only one trick. She was the first player to dunk in a high school girls' basketball game in the state of Colorado. She did that as a sophomore. She dunked on an alley-oop from Vansickle in January. That video has been watched 1.5 million times on Twitter. She got an Instagram account two months ago after her mom noticed too many fake Fran Belibi accounts. She unravels the assumptions about women's basketball. She's far from the first to dunk. Breanna Stewart can dunk. Liz Cambage can dunk. Brittney Griner averaged nearly two dunks per game her senior year of high school. Candace Parker is the only woman to win the dunk contest at the McDonald's All American Game. But Fran, who is expected to compete in the Powerade Jam Fest on Monday night in Atlanta, is on another level. She could be the one. The one who turns haters into lovers. The one who revolutionizes the game. But Fran Belibi has other plans. "Maybe," Fran says, "it'll be someone else." With a 31-inch vertical and 6-foot-5 wingspan, Belibi can easily get her 6-1 frame (with shoes) above the rim. BASKETBALL ALMOST DIDN'T happen at all for Fran. In fourth grade, a friend encouraged her to try it. When she asked her parents, Franck and Suzanne, an answer came swiftly. As doctors juggling their careers and four children -- Fran is the oldest -- the time for athletic extras wasn't available. They could take Fran to tennis lessons on the weekends, but basketball during the workweek was out of the question. "It was a quick and brutal no," Fran says. "And I was like, 'Oh, cool. I guess I'll wait until high school.'" So Fran continued to shadow Suzanne at the clinic she runs with Franck. She watched her mom care for children and absorbed everything she could about medicine. She never outgrew the white coats her mother gave her. The fall before her freshman year at Regis, Fran gave basketball another shot. Even though Regis is a nationally renowned team and Fran had never even played recreational basketball, she thought she could make at least the freshman team, if for no other reason than there weren't many freshmen her height. She counted. She convinced her mom to let her go to one open gym. And then while her mother was out of town, she convinced her dad to let her keep going. "I was like, 'Thank you, God. You've answered my prayers,'" she says, chuckling at the memory. At open gym, Fran liked to touch the rim to gain attention. Each time she did it, she felt more eyes on her. Finally, someone handed her a dodgeball and told her to try to dunk it. So she jammed it through the rim. "I was very bad, so I needed to do something to make the coaches interested," Fran says. "Now they know I can jump so maybe they'll keep me." Word spread to head coach Carl Mattei that there was a player dunking dodgeballs in open gym. His assistant called him and asked who Fran Belibi was. "No idea," Carl remembers saying. The assistant coach explained that she could dunk a dodgeball. "Well, we don't play basketball with dodgeballs," Mattei said at the time, but he wanted to meet her, dodgeball or not. Convincing Suzanne was a much more difficult task. As tryouts wrapped up, she sat Fran down for a talk. "I said, 'You are not playing basketball,'" Suzanne says. "'You better go tell those coaches.'" Fran admitted to Suzanne that she was doubtful she could make the team anyway. She just wanted to play for this little bit of time, but didn't expect it to be anything more than that. That changed when Fran ended up making the junior varsity team. Mattei was enamored with Fran's potential. When an injury on the varsity team opened a spot for a trip to a California tournament, Mattei asked her to come along. Suzanne wasn't having it. "I was like, 'This is a nightmare,'" Suzanne recalls saying to herself. "'Where are we going with this?'" 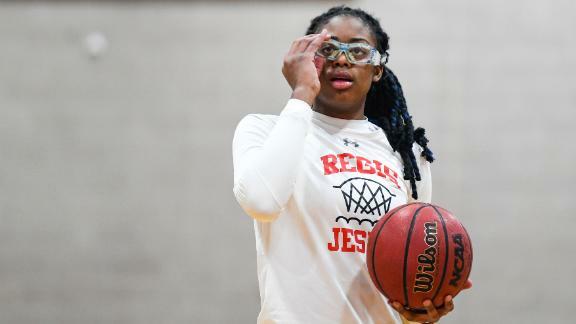 Belibi averaged 21.8 points and 12.3 rebounds during her senior season at Regis Jesuit. But then Mattei dropped by the car one day after practice, casually mentioning that the plane ticket and hotel had already been paid for. Suzanne relented. It was on that trip that Fran became, well, Fran. "Coach Carl had to yell at me so much, that I think he just got tired of saying 'Francesca,'" Fran says. "So he started calling me Fran and it stuck." So did Suzanne's tolerance for Fran's new pursuit. As long as Fran still had time for her other extracurricular commitments and her grades didn't slip, she could continue with basketball. She encouraged Fran as her daughter expressed hesitance because basketball was challenging. It was the fourth game of her freshman season when Franck convinced Suzanne to watch their daughter play. Suzanne was late -- she walked into the gym to see Fran at the free throw line. When she made the shot, Suzanne started clapping and cheering. "She was genuinely shocked that I made it," Fran says. Each point in this process has surprised the Belibi family. After her freshman season, Fran went to a camp at Stanford, a dream school for her because of academics, and got on coach Tara VanDerveer's radar after having played for just a handful of months. She made the under-16 USA Basketball team after playing for just 21 months. She also made the U17 team the following summer. She averaged 21.8 points, 12.3 rebounds and 2.7 blocks per game as a senior. She finished her high school career as Regis Jesuit's all-time leader in points, rebounds and blocks. When she tricked her parents into letting her play basketball three years ago, no one thought a free ride to Stanford would be the outcome. But she signed her national letter of intent with the Cardinal in November. "Basketball just happened," Suzanne says. Doctors with busy schedules, Suzanne and Franck Belibi had reservations about letting Fran try basketball. FRAN IS WHISKED away for a radio interview after Regis Jesuit's 58-28 playoff victory. She fidgets with the headset to get it just right. In the past two months, the media attention has intensified. Cameras from local news crews are posted in the bleachers. Sometimes cameras come to practice, too. Once the interview concludes, children line up to get their pictures taken with Fran. What begins as a handful of kids swells to a stream. Spectators on hand to root for the other team get in line. One after another, Fran puts her arm around them and smiles. She even signs a poster made for her by a little girl and hands it back. • Can the triple-double machine win a title? "You should keep that," she says. Three sixth-grade boys huddle together, elated after their photos. They are adamant that Fran is underrated at No. 23 and is the best player in the country because she can dunk. They also think she's the coolest player since Stephen Curry. Overwhelmed, Fran smiles and grants every request thrown at her. Sometimes she gets recognized wearing Stanford gear while out with her family, though if she says her name is Francesca, that can throw fans off her trail. This is a sneak peek at what could be Fran's future. Nike, Gatorade, fame, fortune. The ability to reset the market for women's basketball players. She's an attraction all on her own. After a game at Chaparral High School, Fran put down a reverse dunk. She was about to walk off the court when the opposing team's cheerleaders started chanting, "One more time! One more time!" So she obliged, this time throwing it down as the backboard was rising. Fran first dunked in a game during her sophomore season. She was out of position, joining a trap that was already in progress. She intercepted the ball near half court and took off. After blowing past the defender, she scooped the ball into her right hand, elevated, and put it through the hoop. "When the first one went in, I was genuinely as shocked as everyone else," Fran says. She called her mom, who was visiting family in Cameroon, to tell her that she had finally dunked in a game. "And she didn't believe me!" Fran laughs. She doesn't quite get it, but Belibi has gained a large following since her dunking videos went viral. The video went viral, but Fran was mostly oblivious. She didn't have any social media. Her parents were out of the country. And she didn't watch much TV. She had no idea it would be that big of a deal because she's been dunking for as long as she has played basketball. It's just another shot, one that she works on almost every day after practice. "Her ability will change how younger girls will think about basketball," Mattei says. "Be like Mike? Be like Fran!" A DUNK COMES with baggage in women's basketball. Lisa Leslie missed a dunk in the first WNBA game ever played in 1997, stuffing the ball on the front of the rim. She didn't think she would try it until the last second. "I can dunk, and I was thinking, 'It'd be big for women's basketball,'" Leslie said to the Orlando Sentinel after the game. Leslie didn't attempt another in-game dunk until she made one in 2002. A dunk has never been just a layup alternative; it's held against women as evidence of inferior athletic ability and is accompanied by the idea that something is wrong with women's basketball. "We are inevitably in constant comparison with men in every aspect of our game," Los Angeles Sparks forward and Women's National Basketball Players Association president Nneka Ogwumike says. "Dunking is an easy cop-out for those who give reasons why they don't follow women's basketball; for those that don't truly value basketball for how it began and how we play it: for raw skills and fundamentals." There's been conversation through the years about whether lowering the rim for the explicit reason of facilitating dunking would be good for the game. 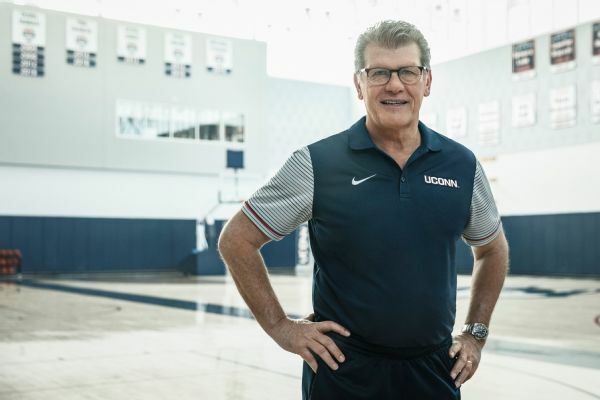 Even though Connecticut coach Geno Auriemma has spoken favorably of the idea -- WNBA All-Star Elena Delle Donne, too -- the general consensus is that women's basketball is just fine, thank you, without a bunch of dunkers. "The dunk is just added flavor," Chicago Sky guard Diamond DeShields says. "It's just a physical capability. A lot of us can dunk, but in a game situation, two points are two points." DeShields put down an out-of-game alley-oop when she was 16, but she's never dunked in a game. 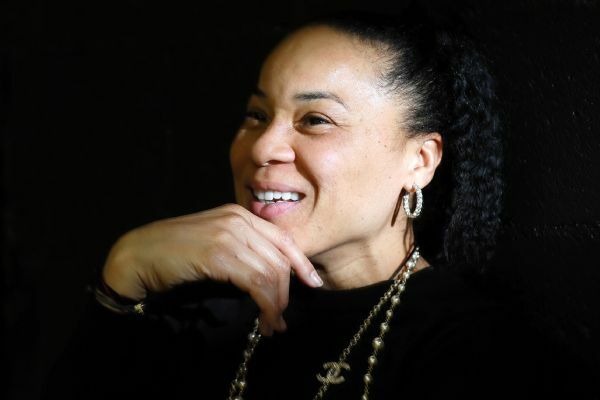 Stewart entered the Powerade Jam Fest when she was a McDonald's All American, but despite her many run-outs while at UConn and with the Seattle Storm, she has never dunked in a game. "It's not the easiest thing to do while I'm in a game," Stewart says. "After exerting energy doing other things, it's not my main priority to dunk. As much as other people are going to like it, it's only one aspect of the game." Fran, however, makes dunking look effortless. Lili Thompson from the Harlem Globetrotters visited a Regis Jesuit practice and threw Fran some alley-oops. Fran attempted about 30 dunks that afternoon. It's customary for her to put down a couple of dunks at halftime before the referees return. After practice, she and teammate Vansickle work on alley-oops. "It's something that people aren't used to seeing," Stewart says. "She's going to be one of those people who continues to raise the bar. Hopefully there will be more like her." The hope for Fran is that she won't need a clear lane and a fast break to dunk. She wants to be able to do a windmill, or a behind-the-back. She isn't satisfied with simply being able to do something. "She wants to be the best at everything," Mattei says. Fran has made three in-game dunks during her senior season. She has attempted nine, including three alley-oops. The misses don't garner much attention beyond the gym in which they happen. And that attention is disappointment. Or surprise, in Fran's case. "I've just missed them," she says. "They hit the back rim and I'm just watching it fly back like, 'Hope someone is there to rebound.'" In college, a miss could mean more. The games will be closer and the players much better. It's a lot harder to get a dunk against Oregon or UConn than Denver East High School. "We've never had anyone that could do it," VanDerveer says. "We're going to take advantage of every skill set available to us. It's not the meat and potatoes or even a vegetable or a salad, but it might be an hors d'oeuvres or a special dessert. It's not going to be something we do all the time, but it will be a part of her playing at Stanford." NOBODY -- OF ANY gender or age -- wants to get dunked on. Against Legend High School, Fran thought she had a breakaway dunk. Her steps were right; she had the power; she just knew that she was going to slam the ball home. And then, instead of feeling her palm hit the rim, she felt hands in her back. The shove sent her careening into the mats along the wall underneath the basket. "Intentional foul!" Fran yelled, making an "X" with her forearms. She wasn't angry. She was laughing as she called for the foul to be given (it was). She gets fouled all the time, on breakaways and under the hoop. She wasn't hurt, and Regis was winning. So what if she didn't get another dunk? "It was not a great decision on our kid's part," Legend coach John Angelo says. "But it happened and was in the heat of the game." In her fourth season of basketball, Belibi already has won international medals as well as national awards. The foul that made Fran angry came five days later, on senior night. It wasn't just because it was senior night, Fran makes clear as she tells the story. Fran doesn't take herself too seriously, not even with the pomp and circumstance of her final regular-season home game. Fran was not pleased about how it happened. It wasn't a breakaway; it was a contested layup. Fran was driving the lane, preparing to go up through the contact she was already anticipating. Instead of going for the ball, a Mountain Vista player shoved her in the side, sliding her legs out from under her. Fran stood up, whipped off her goggles and started charging toward the player who committed the foul, only to be caught midstomp by two teammates. Not that Fran knows what she would have done had she been able to get past. "I wasn't even going to dunk," Fran says. "She was right there." As she tells the story, Fran dribbles the ball between her legs. Then she gestures with the ball affixed to her right palm. Her hands move with her expressions; the ball goes with them. Her hands are 8½ inches long and 9 inches wide. Fran's length is partly what enables her to dunk. She has a 6-foot-5 wingspan. By standing and reaching her arm into the air, she is just 22 inches below the rim. Her 31-inch maximum vertical is more than enough to get her over the rim. Fran is an exceptional athlete, and she hopes to be an exceptional basketball player. The conflation of her athleticism with supreme skill is something that baffles Fran. 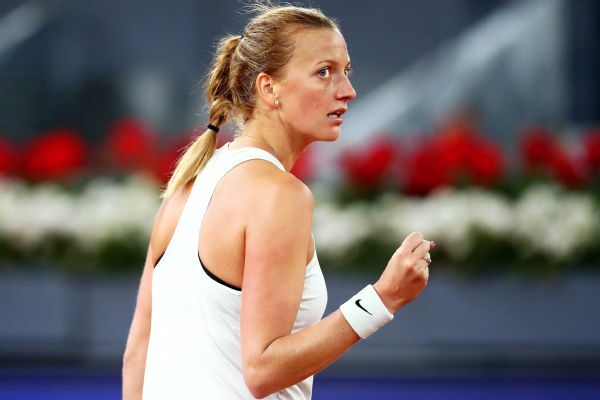 When she reads comments from fans about her being "league ready," she scoffs. "If I don't have to make a layup on the left-hand side, I'm not going to go to the left-hand side," she says. "And you think I'm 'league ready' because I just happen to be able to dunk?" "Someone told me that Coach Carl told them that I was going to be the next Michael Jordan." FRAN TAKES A bite of some leftover mac and cheese in her kitchen. The Belibis are just home from church and are grabbing food before going to watch Hana -- Fran's youngest sister -- play in an evening basketball game. Fran stands behind the massive island next to her dad, talking about food. She loves food and enjoys cooking. When she was younger and less busy, she would make meals for her family. "Three courses," she says. Franck smiles and laughs. Fran looks at him. "Was it not good?" "You need more reps," he responds in his low, measured tone. Fran puts her hand over her chest in offense. Whether it's Suzanne telling Fran at the beginning of her senior year that she doesn't believe Fran can still dunk after she didn't do it her junior year, or Franck poking fun at her cooking, Fran's parents keep her humble and focused. "We don't sugarcoat," Suzanne says, laughing. But admiration is apparent. Fran grew up going to her parents' clinic, spending hours watching the impact of their work, particularly her mother's. Fran points to the time her mother caught a child's cancer early enough to save their life. Anti-bullying posters hang on the wall at Grace Health Clinic. "You have to teach them to love who they are," Suzanne says. Suzanne did that for Fran when she was bullied in elementary school. She did it again when Fran struggled to make sense of basketball as she learned the sport. That's tangible and real. Fran knows what that impact looks like. What's the impact of a dunk? The expectation of her athleticism being transcendent and therefore a destiny she should embrace is not where Fran thought she'd be less than four years after picking up a basketball. Belibi plans to go to medical school instead of the WNBA after she plays at Stanford. "The WNBA wasn't something I thought I could do, considering I'd never played," Fran says. She never dreamed of her draft night, or an NCAA championship. She never considered what team she might play for or if she'd get a shoe deal. But holding a stethoscope? Fran has always dreamt of that. Even as her profile has skyrocketed, her priorities remain unchanged. "Since I learned what a doctor was, I was going to be a doctor," Fran says. She knows that everyone sees her dunk and thinks about what impact she could have on the game. She hears it from Mattei; she reads it online. Some say she could play professionally and then return to school. "You don't just go play and then go back," Franck says. "And she knows that," Suzanne adds. Dunking has opened doors that Fran never knew existed, but she isn't tempted to walk through them all. For now her focus is on Stanford, athletically and academically. As for the pros? "It never occurred to me," Fran says, "that I would be good enough."